Crow bookends: this cute, iron pellet-stuffed crow will be a quirky keeper of your favorite novels. Price: $35, and can be purchased at onekingslane.com. Redwood bookends: custom-made to your liking, these natural and elegant redwood pieces will introduce your books to the outdoors. Price range $150 – $250, available to order from Adam Vorrath, custommade.com. Terracotta pear bookends: these book-smart fruit are sun-dried, oven-fired and hand-glazed, then topped with a metal leaf and stem. Perfect as ends or table decor. Available in medium and oversized; price range $35 – $49 per pear. Purchase at ballarddesigns.com. 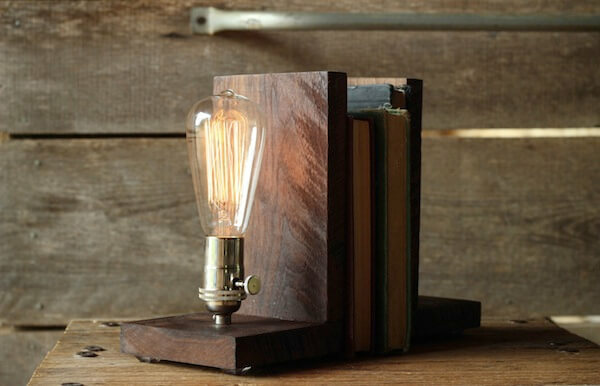 Walnut-modern bookends with Edison lamp: these bookends are custom made, showcasing the natural beauty and warmth of hand-selected wood (walnut, white aak and African sapele-similar to Mahogany). A 30 watt marconi filament Edison bulb lights up when inserted into the 60 watt polished nickel socket. Price: $119, for two. Visit WorleysLighting’s shop on etsy. Upcycled vintage trophy bookends: perfect for an office, kid’s or game room, these retro, mod, and industrial styled bookends can be DIY’d or purchased at the orangedoorcottage shop on etsy for $32 a pair.